planet she'd destroyed and princess she'd killed. In the last two episodes (199 & 200), Galaxia faces off against SM, Sailor Chibi Chibi, and the Starlights, who are the only people left. Galaxia tells them her story, how she is actually a sailor senshi and why she is searching for the Light of Hope. When she takes SM's star seed, Chibi Chibi reveals herself as the Light of Hope and saves SM, transforming her into the Moon Princess (with angel wings!). 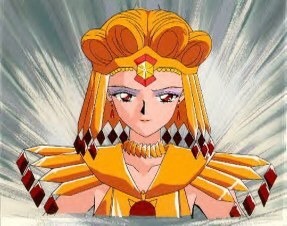 The Light of Hope transforms into a sword, which Usagi must use to seal Galaxia. Chaos then takes complete control over Galaxia's body, and she transforms into a demon with demon wings. As the two fight, Usagi's sword is broken by Galaxia's because Usagi does not wish to hurt her. 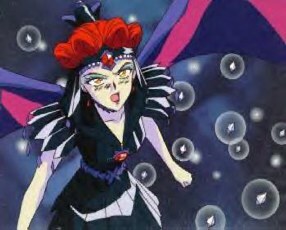 After Chibi Chibi disappears, Usagi releases the power of her own star seed (the silver crystal) and manages to find the last piece of hope left in Galaxia's heart. Chaos is destroyed, and Galaxia returns to her former self. 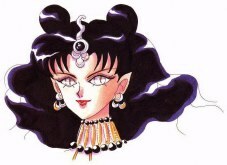 SIM's human name is Chuuko Nezu, she is the producer of Galaxy TV, which is the main office for Galaxia's evil work. She finds her targets by watching TV or looking in a magazine. All of her youmas are called "farces", who are supposed to be the people whose star seeds she took out that turned black. The Sailor Starlights believed that once a person became a farce, they can't ever go back to their human form. ESM is able to turn them back with her Starlight Honeymoon Therapy Kiss attack. Iron Mouse is killed by Galaxia. SAS's human name is Aya Reiko. She appears after Iron Mouse is killed and takes her place. Siren is extremely polite, very different from the usual SM villianess. She has a habit of eating when she gets nervous or when something goes wrong, and she also keeps a diary. Galaxia kills Siren by taking her bracelets as a punishment for too many failures (not too much security in this job). But before she dies, Siren does find out the identities of the Starlights and inner senshi. SLC's human name is Karasuma Akane, she is the production manager at Galaxy TV. Crow was Siren's friend and mentor. She was also the mentor of Sailor Tin Nyanko. Siren and Crow weren't always friends, but when Siren got sent to earth, Crow decided to go along and watch over her (Isn't that sweet?). After Siren was killed by Galaxia, Crow was heartbroken. She found out SM's identity in Siren's Diary and decided to steal her star seed to get revenge for Siren's death. She goes to Usagi's school and threatens to through everyone into a black hole unless Moon gives up her star seed,which she does. Unfortunatly, Sailor Tin Nyanko followed Crow and attacks her, causing her to drop the glass holding the black hole. Crow was the closest and gets sucked in. Her last words are about Siren. mischevious and moves up in the ranks by plotting against everyone else (Got Galaxia to kill Siren and kills Crow for the star seed she won't give up.). Nyanko is later killed by Galaxia, who takes away her remaining bracelet. mirror. Neherania kidnaps Darien and takes him to her dark kingdom. The future is threatened because of this, and Chibi-Usa starts to disappear (literally). The Sailor Senshi travel there to save Darien and the future, but are tricked by illusions and get trapped inside mirrors. Usagi, tired and battered, makes it to the castle. She and Neherania face each other, and Usagi takes pity on her after she tells her story of growing up without having any true friends (which is probably why she hates Usagi so much, cause she has lots of people who really care for her.). Usagi tells Neherania to take her friends,saying, They will understand. With the help of the other Senshi, Usagi transforms into Eternal Sailor Moon. They all give their powers to ESM (Darien and Chibi Moon too, who are back to normal now.) and they help Neherania to start over again.